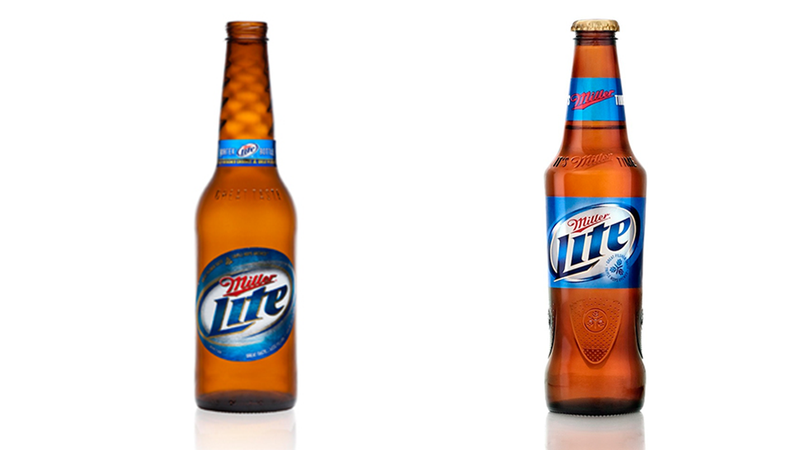 With the help of design firm 4sight, Miller Lite is changing the look of its iconic glass bottle for the first time in 40 years. On the left is your old faithful longneck. On the right is what you'll be imbibing at bars and restaurants this summer. The new bottle is more modern, has broader shoulders, and a contoured grip. MillerCoors says it's easier to hold than a traditional cylinder-shaped bottle. Beer that's easier to grip? Can't argue with that. The timing of Miller's redesign is interesting. Budweiser just introduced a new bow tie-shaped can, a literal interpretation of its bow tie-shaped logo. Pepsi, too, just redesigned its 16- and 20-ounce plastic bottles for the first time since 1997. Perhaps the timing is coincidental. Or perhaps beer companies are trying to keep up with the craft beer phenomenon, which has enlightened us to how bottles can influence taste. Either way, updates are good. While we love the classic longneck look, we're not afraid of a little change. Let us know what you think. Why Would Anyone Buy a Bow Tie-Shaped Beer Can That Actually Gives You Less Beer?